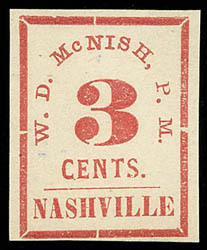 Confederacy, Nashville, Tenn., 1861, 3¢ carmine, position 2, without gum as usual, clear to large margins, fresh and Very Fine. 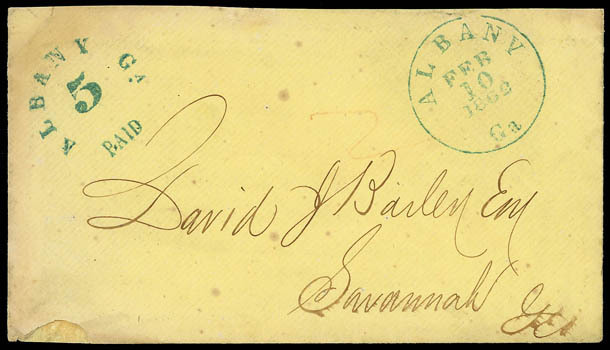 Confederacy, Albany, Ga., 1861, 5¢ greenish blue, excellent strike on amber cover to Savannah with clear Albany, Ga./Feb 10, 1862 cds in matching greenish blue ink, includes a short business letter; small repair at lower left, F.-V.F. Scott No. 3XU1 Estimate $300 - 400. 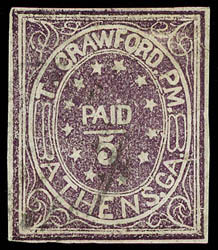 Confederacy, Athens, Ga., 1861, 5¢ purple, Type II, clear margins to touched at bottom, deep rich color, without gum, Fine; with 1961 P.F. certificate. 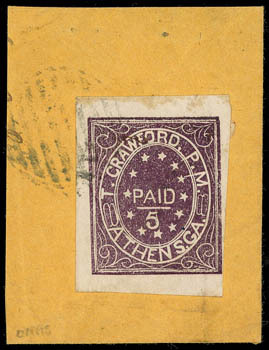 Confederacy, Athens, Ga., 1861, 5¢ purple, Type II, huge margins except clear at bottom right, beautiful color and impression, tied by circular grid cancel on orange piece, Very Fine. 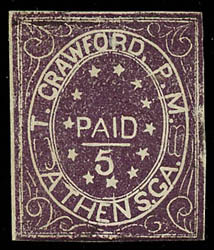 Confederacy, Athens, Ga., 1861, 5¢ purple, Type I, four full margins, lightly cancelled, F.-V.F. 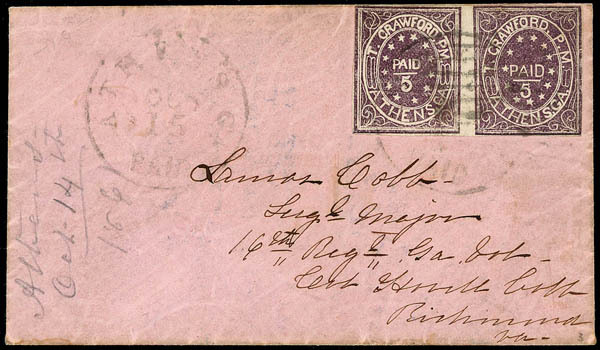 Confederacy, Athens, Ga., 1861, 5¢ purple, horizontal pair, Types I-II, margins to touched, tied by grid cancel and "Athens Ga., Paid, Oct 15" 1861 cds, additional strike at left on pink lavender cover addressed to Lamar Cobb, Sergt. Major, 16th Regt Ga. Vol., care Howell Cob at Richmond Va., pencil "Athens, Oct 14th 1861" docketing at left, Very Fine and choice, ex-Hart, Walske; with 1982 C.S.A. certificate. Scott No. 5X1 Estimate $3,000 - 4,000. ONE OF THE FINEST COVERS BEARING A PAIR OF THE ATHENS GA. POSTMASTERS PROVISIONAL. THIS TYPE I-II COMBINATION REFLECTS THE TWO-SUBJECT WOODCUT ENGRAVING. The Athens two-subject woodcut engraving showing the small "Paid" at left and large "Paid" at right. Lamar was a son of Howell Cobb (1815-1868). Howell married Mary Ann Lamar, daughter of Colonel Zachariah Lamar of Milledgeville Ga., by whom he had 12 children. 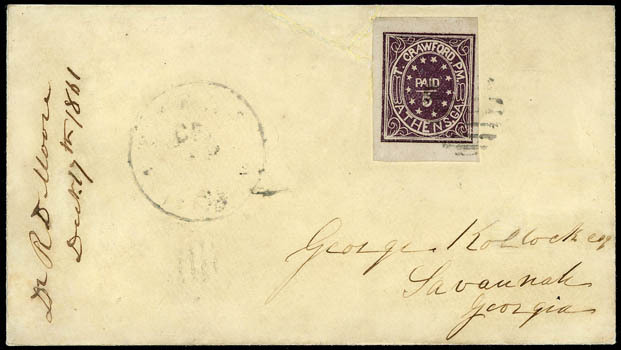 Confederacy, Athens, Ga., 1861, 5¢ purple, Type I, huge margins to full, tied by open grid, matching "Athens Ga. Dec." cds on 1861 cover to Savannah Ga., docketed "Dr. R.D. Moore, Decr. 17th 1861" at left; cover expertly repaired, Very Fine appearance, ex-John R. Hill Jr.
Confederacy, Athens, Ga., 1861, 5¢ red, Type II, large margin at left to barely touched, bright color, neat open grid cancel; tiny surface scuff to the left of the "C" in "Crawford", Fine appearance and rare; with 2006 P.F. certificate. 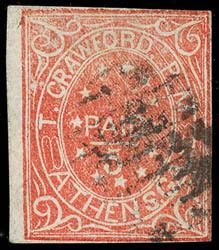 ONE OF ONLY TWELVE RECORDED EXAMPLES OF THE ATHENS 5¢ RED PROVISIONAL, ONLY THREE OF WHICH ARE OFF-COVER USED EXAMPLES. 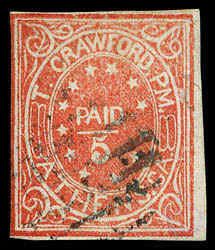 According to the Crown census, there are seven recorded covers and an additional half-cover bearing the 5¢ red, which are all dated in March or April 1862. In addition to these 8, there is one mint original gum example and three used off-cover examples. Confederacy, Athens, Ga., 1861, 5¢ red, Type I, clear to large margins except touched at left, strong bright color and impression, neat open grid cancel, Fine and rare, ex-Ferrary, Felton; with 1989 C.S.A. certificate. 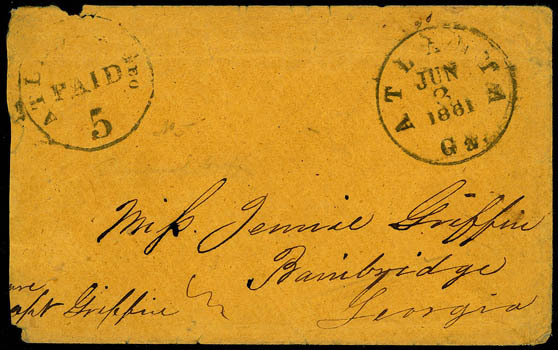 Confederacy, Atlanta, Ga., 1861, 5¢ black, handstamp with "Augusta, Ga., Jun 3, 1861" cds on cover to Miss Jennie Griffin in Bainbridge, Georgia, care Capt. Griffin; slightly reduced at left and few edge nicks, Fine, a very early use.